So on Friday afternoon, the four of us (Kari, Sue, Sarah and I) left for Rhinebeck, NY to attend the New York Sheep and Wool Festival (aka "Rhinebeck" in knitting circles). It was AWESOME!!!! 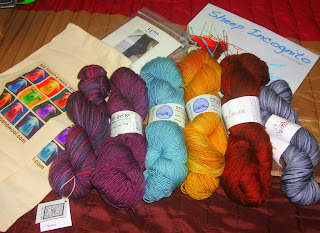 For everyone else's take on Rhinebeck, visit Two Tangled Skeins, Sue and Kari's podcast! We stopped for dinner in Herkimer, NY at a sweet little 50s style diner called Crazy Otto's Empire Diner. If you're ever driving through upstate New York and have the opportunity to stop in, you will not regret it! The food was fantastic, the prices were reasonable, and so much memorabilia!! Sue was thrilled because there was a Marilyn poster on the ceiling just behind our table. License plates, movie posters, old tole signs.... just amazing! And the staff were super-friendly too. I plan on taking Rob and the kids there, maybe in the spring, because he'll love it! There may have possibly been an incident regarding someone's forgotten luggage and a midnight trip to Walmart, but other than that, the first night was relatively uneventful :D Saturday morning dawned bright and early, and we fed ourselves and headed for the fair. SO MANY CARS. The fun started immediately inside the gates, as we ran into Ysolda Teague, freaked out, and took Sue and Kari's picture with her! I may have developed a slight addiction to sock yarn, because that's pretty much all I bought on Saturday. I got a calendar from Sheep Incognito, which I had signed by the lovely artist, Conni Tögel. Then we wandered a bit and I got a skein of Gale's Art sock yarn in the Mars colourway which is going to be my Falling Leaves socks for the KAL in November, three skeins of Blue Moon Fiber Arts' Socks That Rock at The Fold's booth (the owner is hilarious and a really nice guy!) in "The Winter Blues", "Jasper" and "Ochroid" colourways. I also grabbed a sock pattern by the very talented Adrienne Zu at The Fold - It was called "Lynn"... I had to. And last, but certainly not least - because this stuff is amazing and you have to experience holding it to believe how freaking awesome it is - I stopped by Bittersweet Woolery to talk to the lovely Miss Tina for a while, and I ended up finding a skein of her Guilty Pleasures yarn in the "Ash On My Tongue" colourway that is so soft, so pretty, so MINE. I loved it so much, I went back the next day for more, but I'll talk about that in a second. Shortly thereafter, we all piled ourselves and our plethora of purchases back into Sue's jeep and headed for home. All in all, it was a fantastic weekend and I can't wait for the next roadtrip! Let it be noted that Sir Pugglesworth was so excited to see Kari when we got home that he ran around Sue's house in a mindless craze for a full ten minutes before calming down enough for Kari to clip his leash on!